The good news and the bad news. And the good news. And the bad news. | Learning to dance in the rain The good news and the bad news. And the good news. And the bad news. The good news and the bad news. And the good news. And the bad news. The devil (or the debil as my kids call him) has been working HARD on me this week friends. BUT, that tells me that I am doing something right or else the old debil wouldn't be paying a bit of attention to me! ; ) So, I have compiled a list of the bad news and the good news......a pros and cons list of sorts.......to show you (and me) that even when the debil is after you, the good usually outweighs the bad! 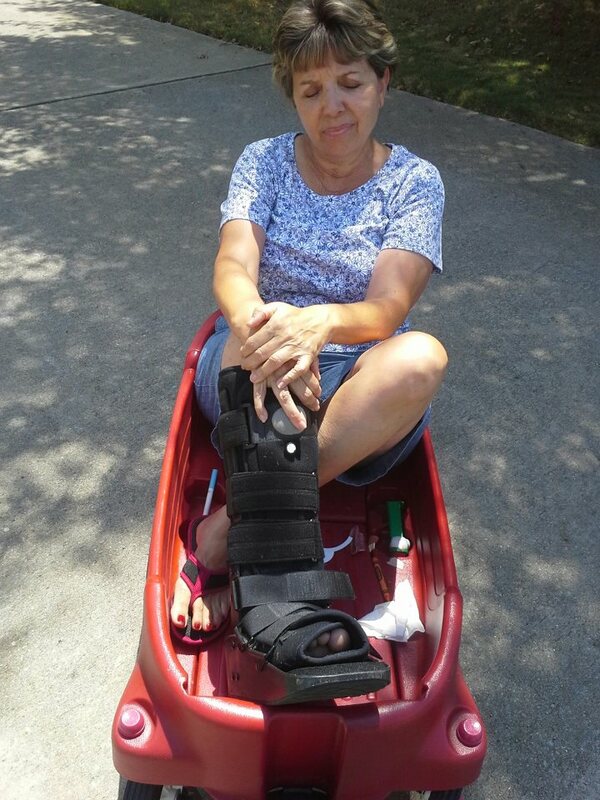 -My mom broke her foot on Tuesday. While I was at work. Trying to get a lot done before I leave the country. It is I can't put any weight on it except to go to the bathroom broken. So, needless to say, she has required A LOT of my help this week. Like I had to drag her from our garage to the front door in the wagon because she couldn't get in the house. Can you say bad timing? It reminds me of the time I had my gallbladder removed and was sooooooooooo looking forward to a couple of days of outpatient surgery earned rest, when she decided it would be a GREAT time for her appendix to almost explode....but I digress. -The kids and I went to the ortho doc to get MY knee looked at on Monday. It has been hurting more and more since my 5K, and since it has been operated on before, I wanted to be sure I hadn't done something major to it. I went back for the results today, and I have a stress fracture. In my knee. A big one. Doctor says wear a brace, which isn't nearly as bad as the boot I wore for 5 weeks....remember that?!?! It seems like sooooooo long ago. ; ( Anyhoo, he says stay off of it for 4 weeks and I should be good to go. How will I resume my training 4 weeks before the marathon and pull it off? Great questions. Let's talk about it after I get back from CHINA. Where I am going tomorrow. The day after now. - While trying to rush around and get work done, doctor appointment done, and get home to take care of my 2 kids and 1 ailing mother, I locked my keys in the car. I haven't done that in forever. Luckily, I was on the phone with my BFF Gina while I had a bit of a come apart.......in the parking lot......in the rain.......and she came and got me. We found my spare key and all was right with the world. Just a really bad time to loose......time! 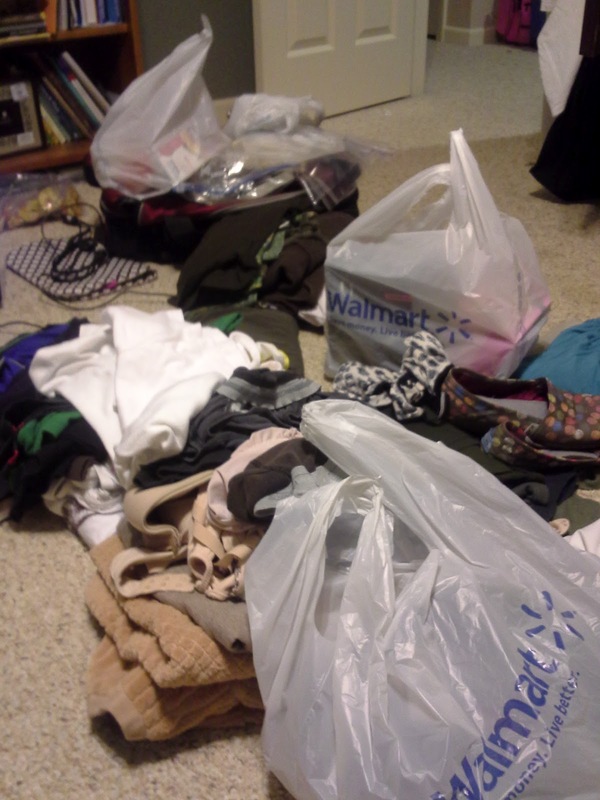 -I haven't packed. Not one thing. But I am just about to start shoving this mountain of stuff into that tiny red carry on size suitcase in the background. Wish me luck. -I am blessed to be a part of a GREAT team going to China tomorrow and once I get out of my house, preferably with all of my stuff, and get to the airport I will become totally stoked! Please pray for our team! -I really thought my MRI results would show something that would put me out of the marathon all together. It is a huge praise for me that I still have a really great shot at finishing this thing with my team.....well.....waaayyyyyyyy behind my team. BUT, I said from the very start that if I could get up to 5 miles I knew I could do it, and I reached 5 miles right before my knee became to painful to run. So that is a blessing. I may finish last.....but I just want to finish and I am super stoked that it is still a possibility. I AM STILL IN THE GAME! -I MET MY PRE-CHINA FUNDRAISING GOAL! This is huge folks. I have become CONSUMED with fundraising and training because God has made my heart CONSUMED by this cause and the children and families that it will help! I knew I couldn't fully leave this behind and focus on China if I felt like I was behind on my fundraising. God is great and I not only met my goal but exceeded it! -I have an amazing family and amazing friends that I know will take care of things while I am gone. I have stuff lined up for Friday & Saturday for the kids, and then they will be with their dad all next week, which will give Emmy some much needed down time for her foot to heal. -I have a wonderful church family and an amazing small group. I feel so blessed by them all! -The debil may try and try to keep me down, but I have a KING who died so that I might live. So I'm gonna keep on keeping on as long as He allows me to do so! See? The good always outweighs the bad! Please pray for us as we travel and for my mommy heart and my kiddos while I am away. And if you are one of the few people who actually read this blog, could you leave a comment and let me know you read this? I could really use the encouragement right now! Watch out Asia, here comes jennymo! Praying for your trip and yes, our God (the good) always outweighs the bad! I'm jealous you're headed to China. I love that country and its people! I also love your blog! I'll be praying for you this next week! I am praying for you Mrs. Jenny! I pray that you will heal quickly and and that His will may be done through you in China. Praying for you and your team Jenny! You are awesome, I hope you know that- I look up to you so much! Excited to hear about the trip when you return.